With the 16GB Google Nexus 4 taking as long as 6-7 weeks to arrive from the Google Play Store, and with carriers and retailers just about all sold out of the heavily in-demand smartphone, those who absolutely need the handset are turning to the one place where demand meets supply, eBay. 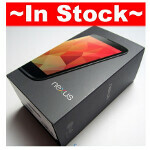 The 16GB SIM free Google Nexus 4, a device that costs $349 on the Google Play Store (when in stock) or $499 at T-Mobile, was recently priced at $649.99 by an eBay seller. Since then, the Google Play Store again had a successful sale of the phone and the same eBay seller is now asking $699.99 for the same device. It's a perfect example of supply-demand in practice. So far, this seller has rung up 36 units and has just three remaining. But sellers like this one will soon have to adhere to some new rules as the auction site has added restrictions to the posting of Google Nexus 4 units for sale, thanks to the high number of units that have been sold. Authorized resellers will have no restriction on the number of units they put up for bidding or outright sales each week. Top-Rated Sellers will be able to offer 8 units weekly, which would seem to take the air out of a lot of balloons belonging to marginal sellers. Sellers meeting minimum performance standards will be allowed to offer 4 units weekly and new sellers that have confirmed certain personal information will be able to sell 1 unit per week. Ebay will not allow those who fail to confirm their personal information, or meet minimum performance standards to list the Google Nexus 4. And those selling Google Nexus 4 related domain names will be allowed up to 4 listings per week. It is all about keeping the scammers from taking advantage of a device that it is in extremely high demand during the holiday season, to rip off an unsuspecting and gullible public. If you are planning to buy the latest stock Android smartphone on eBay, you cannot simply go by a seller's rating. One eBay expert told us that some eBay criminals have been known to steal the identity of a highly rated eBay seller in order to trick the public. And remember, the current "Buy It Now" prices are around $350 higher than Google is charging for the 16GB variant, and is even $200 higher than T-Mobile's price. If you plan to give the phone out as a holiday gift, you might have no choice but to pay up for the model, or switch to a different phone. For $649, you could purchase an unlocked 16GB Apple iPhone 5 or the HTC DROID DNA for $599.99 to name a couple of cheaper off-contract phones. yeah, if what Google has done becomes a trend then this may be a restriction ebay should apply site-wide because there's definitely a profit to be made from ordering Nexus 4's in bulk like that one guy did and reselling them at the normal value of phones like that off contract to people that don't know better or are just sick of waiting for their new Nexus device. It's not actually a new policy, they are just applying an existing policy to the Nexus. The iPhone has been subject to a similar policy for a while, now. did i say it was a new policy? xD i'm saying the policy should automatically be for every device so people will know not to do like some did with the Nexus 4 and help sell out the Google Play Store much faster to make their own profits. because of one person 36 people weren't able to get their Nexus 4's when they wanted to. Actually people might wanna have a good android experience before 21st dec . If you know what i mean. The impatience is slightly justified. I bought 1 nexus 4, 16GB from google play store on the 27th for $350 and shipping date was 1 to 2 weeks. Thank you phoneArena for spreading the news about this hot device on time when google offer it again for sale on the 27th. this is just nuts,cant even think buying nex4 @ ebay.and says seller asking $699.99.wtf it cost more then the unlocked 16gb iphone5,...no no no! Will buy LG Nexus next year in 2nd quarter from ebay.in once the price falls. Bought shiny Galaxy Nexus two weeks back from ebay.in for ~$380 and enjoying the same right now. Currently yes on ebay.in it is being quotes at that price (~$700). 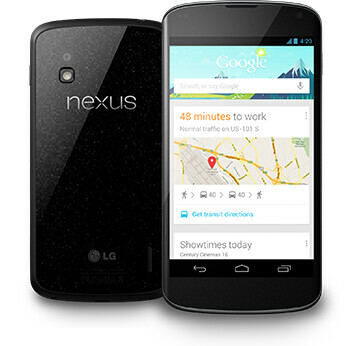 it's still a Nexus so its a shame that Google can't keep it in stock very long. hopefully all of the big developers haven't had any problems getting theirs. Googe has to be blamed on this one. If they can only keep up with the orders then this thing won't happen. Google have a lot to learn on selling hardware. yes you are an advertising company and hope next time you do it right so that poor guy won't spend $699 on buying your phone on ebay.